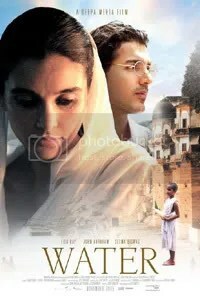 Even though it’s been out on DVD for over a year here in Canada, Deepa Mehta‘s Water, the third in her elemental trilogy of films, has been nominated for a 2007 Academy Award for Best Foreign Language Film. I’m guessing that it wasn’t released in the U.S. until 2006, which is why it’s eligible. I figured that since it’s the first non-French film from Canada to be nominated for the award, I should check it out, if for little other reason than patriotism. That, and it was on Movie Central, so I didn’t have to expend any effort or money to do so (Oh Canada, I stand on guard for thee). Although, a movie filmed in Sri Lanka set in 1930s India spoken entirely in Hindi isn’t exactly the most Canadian of films, but still, it’s nice to see some movies coming out of Canada (or, at least made by Canadian filmmakers, presumably with Canadian money behind it) get recognised internationally. It’s too bad the movie isn’t really worth the acclaim. Unless you’re into languid period pieces rife with explicit metaphor and feminist themes. Actually, that doesn’t sound too bad, if the themes worked, the characters were interesting, or the story was involving. Water tells the story of widows in India, forced to live out their days in an ashram so as to not contaminate society. Following Hindu tradition, when a man died, his widow would be forced to spend the rest of her life in a widow’s ashram, an institution for widows to make amends for the sins from her previous life that supposedly caused her husband’s death. If a widow does not remain chaste, she is destined to be reborn in the womb of a jackal. We’re introduced to this world through Chuyia (Sarala), an eight-year-old who was forced into marriage with an elderly man, whose death makes her a widow without having known her husband. She is then shuffled off to the ashram, forced to live out her life without understanding anything of her situation. Eventually, her spirit, along with the reforms sweeping through the country from the teachings of Mahatma Gandhi (Mohan Jhangiani), forces the other widows to question the traditions that force them there. It’s an interesting story in the long history of men using religion to subjugate women, told in an uninteresting way. Worse, the feminist themes of the movie are undercut by the fact that it takes a man to show them the error of their situation, be it Gandhi (who is shoehorned into the conclusion of the movie, leading to an unsatisfying finish to the story), or through Narayan (John Abraham), a young reformist and follower of Gandhi, who meets Kalyani (Lisa Ray), a young widow who is prostituted by the head of the ashram to make ends meet, and decided to take up the widow’s cause and win over Kalyani in the process. It’s Narayan who gives the speeches about the injustices of the Hindu practice, Narayan who reaches out to Kalyani, and Narayan who points out the hypocrisy of the situation to another widow, Shakuntala (Seema Biswas), leading the movie to its climax. The women aren’t given much agency in the story (even relative to the little amount they are afforded given the restraints placed upon them by society), making him the Prince Charming figure of the movie, swooping in to save the day. The movie isn’t a complete waste, and if you’re into lush period dramas you might even like it. Cinematographer Giles Nuttgens has shot a gorgeous film, earning himself a Genie Award in the process (for you non-Canadians, and Canadians that are unaware, the Genie is Canada’s premier movie award). Believe me when I tell you that gorgeous looking films aren’t exactly a signature of the Canadian film industry. However, despite the interesting subject matter and fantastic photography, Water is merely an average film with a lot to say, but no interesting or new ways to say them.